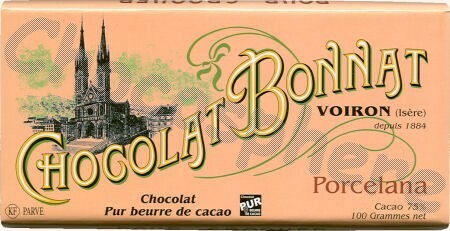 Bonnat Porcelana 75% Bittersweet Chocolate This rare cocoa, with an annual production of less than 1000 Kg, comes from an ancient plantation in Venezuela. Porcelana beans are unique, in that they are a translucent color. Fragrant and well balanced, the resulting chocolate is filled with the complex flavors imparted by the soil around Lake Maracaibo. From it's powerful fragrance to it's delicate taste, this chocolate will exceed the expectations of the most demanding chocolate connoisseur. Kosher-Parve, 100g/3.5oz per bar.